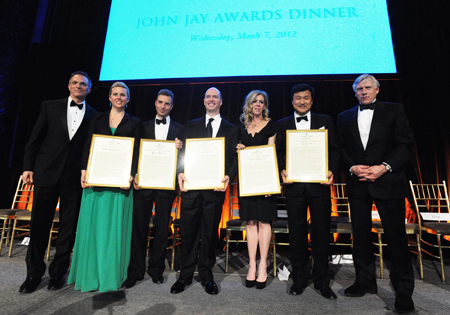 On March 7, five accomplished alumni were presented with 2012 John Jay Awards for distinguished professional achievement at the John Jay Awards Dinner, an annual black-tie event, held this year at Cipriani 42nd Street. View photos from the dinner. The honorees were Dede Gardner ’90, Ellen Gustafson ’02, Ben Horowitz ’88, Daniel S. Loeb ’83 and Li Lu ’96, ’96L, ’96 Business. Read more about the honorees. (Left to right) Interim Dean James J. Valentini; Ellen Gustafson ’02; Daniel S. Loeb ’83; Ben Horowitz ’88; Dede Gardner ’90; Li Lu ’96, ’96L, ’96 Business; and President Lee. C. Bollinger. PHOTO: EILEEN BARROSO Proceeds from the dinner benefit the John Jay National Scholars Program, which aims to enhance academic and extracurricular experiences for outstanding first-year College students. John Jay Scholars are invited to participate in panels, discussions and outings. This year’s dinner raised $1.1 million, as announced at the start of the dinner by University Trustees Chair William V. Campbell ’62. Columbia College Alumni Association President Kyra Tirana Barry ’87 welcomed the attendees and especially welcomed John Jay honorees from prior years. She introduced Yusaf Ahmad ’12, a John Jay Scholar who spoke on behalf of all scholars. Interim Dean James J. Valentini also addressed the group of almost 500 alumni, guests, faculty and students, noting how proud he was to “have people of such distinction with us tonight.” President Lee C. Bollinger spoke briefly as well, announcing that the seventh Global Center will be opening, in Santiago. Each of the honorees addressed the group, all touching on what Columbia had meant to them and how grateful they are for the education they received, which enabled them to be successful and to give back to the world. The event, which concluded with a medley of Sans Souci and Roar, Lion, Roar performed by the Clefhangers, is named for founding father and first secretary of the treasury John Jay (Class of 1764). The John Jay Awards have been presented annually since 1979.